The team at Forgely, a people management software specifically designed for the pest management and lawn care industries, has released a new insider’s guide to what owners needs to know to hire the best pest management technicians and keep them on their team. For a limited time, this eBook is FREE to download. 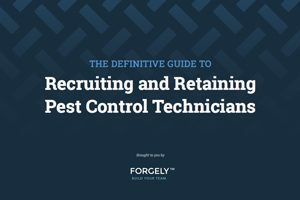 Whether you manage a team of three or 3,000, The Definitive Guide to Recruiting and Retaining Pest Control Technicians covers such topics as where to find great candidates for your open positions; how to develop a seasonal hiring strategy; the easiest ways to train technicians; and more.